With workplace risk profiles constantly changing and the training and equipment maintenance requirements increasing each year, many organisations go into reactive mode with regards to managing their working at heights systems and PPE. As a result, we see organisations adopting a ‘tick the box’ risk management system just to meet the minimum compliance requirements. We need to look to more effective ways to manage the changing risks of our workplaces and ensure safety protocols meet these needs. When we do this, we discover ways to remove the layers of complexity from equipment application and selection, make it more simple to train our teams and maintain their skills, ensure what we specify is fit for purpose and all the while comply with any regulatory requirements we face. When workers choose to work at height without complying with regulations, even during a task that takes just a few minutes or occurs at a low height, the risks, and costs, can be enormous. Fall-related injuries and deaths can be devastating on a physical, emotional and financial level for the worker, the worker’s family and the company. In addition to the loss of life or injury, a fall can easily cripple or bankrupt a business. Avoid work at heights, where possible. When working at heights is essential, ensure that workers are not exposed to unnecessary risks. Where it is not possible to eliminate fall risk, use a suitable fall protection system to minimise consequences of a fall. Choose PPE and access methods that allow workers to perform their tasks with minimal interference. How do you decide what equipment to use? The nature of the work being carried out needs to be the starting point, as not all harness and connection methods will be suitable for all tasks. As part of the risk profiling, the potential for passive protection measures needs addressing before prioritising personal protection measures. When selecting work equipment look at all the risks, not just those associated with the ‘use’ phase. Duration and frequency of use will help determine whether permanent solutions are required, or if a PPE is the most suitable method. Passive protection is equipment which can protect more than one person and, once properly installed or erected, requires minimal actions by the user to make sure it will work. Examples include hand rails, scaffolds and elevated work platforms (EWPs) which use guard rails to reduce the risk of a fall. Personal protection is equipment which protects only the user/wearer and requires action by the individual, such as properly wearing and adjusting it, for it to work. Examples include fall arrest equipment including harnesses, lanyards, personal fall limiters (PFLs) and self retracting life lines (SRLs) which minimise the consequences of a fall. This also includes fixed/engineered systems like horizontal life lines and vertical life lines (ladder systems) to provide permanent connection means in collaboration with appropriate PPE. This method is termed “Collective Protection” as it involves multiple elements from the Hierarchy of Controls. Make sure the people who select, assemble, use and supervise the use of the equipment have all the relevant information, eg, manufacturer’s instructions, have been trained and are competent. Make sure the equipment is regularly inspected and maintained, including ladders and stepladders. If you have to use a fall arrest system you must make sure there is adequate clearance for it to deploy, so the user does not hit an obstruction or the ground before the fall is stopped. If you have to use nets or airbags they should be located as close as possible to the working level because they do not work as effectively if the fall distance is too great. If you have to use a fall arrest system, you must make sure a rescue can be carried out if a worker is left suspended from a roof edge. Where possible, the workspace should be redesigned to minimise the need for people to work at height. 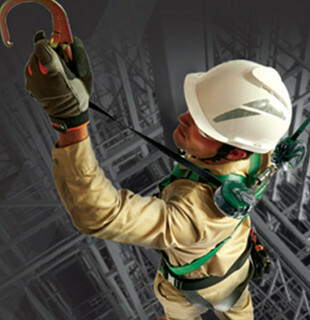 If working at height cannot be avoided, undertake the work using passive fall protection systems. Use a work positioning/restraint system to prevent the user reaching a potential hazard. Undertake the work using appropriate fall arrest equipment to minimise the distance and force if a fall should occur. Guardrail systems: Minimise risk by providing a barrier to the hazard while protecting more than one worker at a time. Walkway systems: Create a level, anti-slip surface that keeps workers protected against potential fall hazards. Restraint and energy-absorbing lanyards: Prevent falls and keep fall arrest forces below AS/NZS, ANSI, CSA, OSHA and EN limits. Self retracting devices: Minimise fall forces during a fall or stop a fall quickly. Body harnesses: Stay comfortable and safe even in a fall event. Personal rescue devices: Lower workers to the ground in a controlled descent in the event of a fall. Horizontal, vertical and inclined systems: Unique safety solutions for those working on edge. MSA can help. By working with us, you can design a comprehensive and fit-for-purpose fall protection plan that stays abreast of changes in standards and removes the complexity of product selection, with the core focus of keeping your workers safe.